In a tight job market and in the age of internet-based diploma mills, resume fraud is an increasing concern among employers, including those families that employ nannies or other household employees. On the other hand, with today’s internet-enabled easy and cost-effective access to information, families can easily verify resume facts with a few clicks of the mouse. The following examples show how seriously resume fraud is taken. David J. Edmondson, Radio Shack CEO, resigned under pressure after it was learned that nearly a decade before, he had claimed on his resume that he held two degrees from a Bible college. The company learned that the school had no record of Edmondson graduating. Notre Dame football coach George O’Leary was forced to resign just five days after stepping into the coach position after it was revealed that he lied about his academic and athletic achievements. Food Network chef Robert Irvine was fired from the network in 2008 after it was discovered that many of the culinary accomplishments he claimed to have achieved were fabricated. 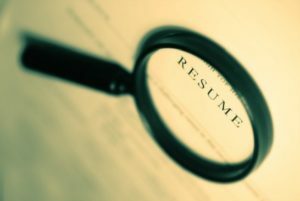 Such has been the growing concern of resume fraud within employers’ ranks that the Washington State legislature passed a bill in 2006 that would create civil and criminal penalties for lying on resumes or failing to disclose that a degree is from an unaccredited institution. The international employment screening firm, HireRight, conducted a 2014 survey which revealed that 88 percent of employer respondents reported discovering a person who lied on a resume. Checking resumes is particularly important when it comes to caregivers in the home. If a nanny says she has a certificate in early education and it is important to the family that she has, then you need to check it out. Similarly, if a senior caregiver for an aging parent claims to be a certified home health aide or a Licensed Practical Nurse without the required qualifications, this could be extremely dangerous in certain circumstances. Therefore, lying employees who are directly involved with patient care are aggressively pursued in the legal arena and typically reported to the U.S Department of Health and Human Services to bar them from future employment in that type of work. To learn more about how A New England Nanny takes steps to combat resume fraud and our other procedures for ensuring your family’s peace of mind, contact us today at (518) 348-0400.